In contrast to the old world look of your first set of shots, try an obviously contemporary style to finish off the shoot. Stop in at Segs in the City and rent some segways to explore the rest of the neighborhood. Each segway is about $45 per hour, but you can easily complete your shoot within that time frame. Learning how to ride will be new and exciting for everyone in your party, and the laughter will shine through in every picture. You can have all of your wedding party rent a segway, or rent them for only the bride and groom. Try getting some pictures of the bride and groom on their segways zooming past the bridal party and waving goodbye, or images of the whole group on their respective segways traveling in a line up the sidewalk. 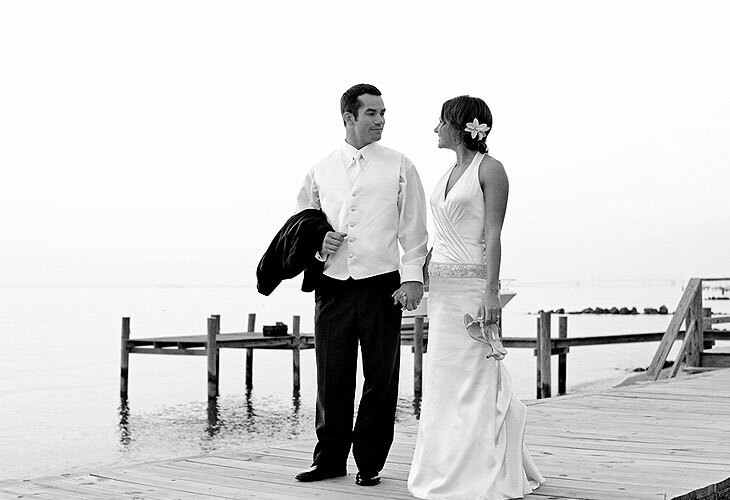 Your trip to Fells Point on your wedding day will be a nice refreshing respite from the stresses of wedding planning and it will leave you rosy-cheeked and cheerful for your impending nuptials. Wedding photography always looks stunning when it is taken against a backdrop of blossoming flowers and verdant lawns. For some truly remarkable floral shots, take your wedding party to Baltimore’s Cylburn Arboretum. The Arboretum charges$150 for two hours of professional photography, but the cost is justified when you see the unparalleled beauty of the grounds. Take some couple shots of the bride and groom leisurely strolling through the gardens, or get unique group shots in front of the towering stone manse with its ornate plaster columns. For another dose of floral delights, direct your limo driver east over to Sherwood Gardens in Baltimore’s lovely Guilford neighborhood. There is no fee to traverse this amazing community garden, which is shocking considering the scope of flowers and landscaping on display. Take some group shots of your bridal party with vibrant blooms as your backdrop, or the bridal couple can literally “tip-toe through the tulips” since in the growing season Sherwood Gardens has a wealth of tulips on display. Your garden photography itinerary will make you feel miles outside of Baltimore without ever leaving the city. If you are one of those couples who adore the theater, your Baltimore wedding photography session can cater to that passion. With a host of theaters to choose from, you will want to narrow it down to some of the most architecturally stunning. Start off at the historic Hippodrome Theatre, which was originally a Vaudeville theater. You and your soon-to-be spouse can pose for pictures underneath the iconic marquee and the curved awnings. Jump into your limo and head to the Joseph Meyerhoff Symphony Hall. This architecturally stunning building is a great backdrop for those larger group shots. Include all of your wedding party members in some elegant pictures against the softly curving brick overhead. The rounded edges of the building will give your shots an understated grace. You will have to hope back in the limo to reach your final stop, the old school cinema Baltimoreans know as The Senator Theatre. A city staple, this theatre has retained its glamorous marquee that is reminiscent of old Hollywood. Take some shots outside of the theatre in front of the marquee. Couple shots work wonderfully in this type of setting, so have the groom scoop up the bride in his arms for some cuddly, intimate shots under the overhang. For group pictures, have the bridesmaids line up in front of the historic theatre with the bride in the center, or do the same with the groomsmen and the groom. No theatrical itinerary is complete without the big smooch at the end, so make it passionate and you will end up with photos you will be proud to show off.